Item as described. Super Fast shipping! Thank You! Perfect!! Fast shipping. Thank you! A yummy nutritional supplement to add to your daily life. This drink has quality ingredients and love that it has no sugar. It's non gmo and organic. I put this in my 64 oz water container and drink it through out the whole day. It makes me drink lots of water along with my vitamins, nutrients and minerals. My husband and I both take it daily, we both usually only take half the does which is one scoop each in our big water containers, because we also try to eat a very healthy diet, but knowing that many things in life rob us from getting all that we need. We have been taking it continuously for over 2 years now and can't image life without it. i'm super sensitive to anything with sugar in it, it makes me crash, but this sustains and energizes me. Great product and was delivered quickly! 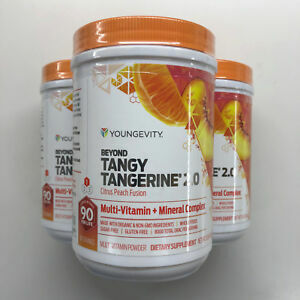 Beyond tangy tangerine is one of the best multivitamin complex.